Colombo Airport Ratmalana, A Beginning of a New Era. The Master Plan of the Colombo Airport Ratmalana has been developed for its envisioned future, for the period from 2018 through 2030, positioning it as an “Exclusive Gateway to Colombo, Sri Lanka’’. Colombo Airport Ratmalana has great potential to contribute to the growth of the tourism industry in Sri Lanka. Considering the socioeconomic changes taking place within the country, the region, and the world, Airport and Aviation Services (Sri Lanka) Limited (AASL) looks into the emerging opportunities in order to meet the growing demands in the foreseeable future. We believe that future growth and development of Colombo Airport Ratmalana is linked closely to the economic growth and prosperity of our community. The long term strategic goal of Colombo Airport is to bring the airport to the optimum operational capacity by maximum utilization of existing resources. Colombo Airport Ratmalana is the first International Airport in Sri Lanka Since 1935, which is located in Ratmalana just 14 km south of the Sri Lanka’s Business Capital of Colombo. This Airport operates around 70 Aircraft movements per day as the Domestic Aviation Hub by-serving to all domestic*c aviation needs including Commercial Passenger Aircraft, Aviation Training Schools, International Corporate Jets, VIP & VVIP movements, humanitarian missions during national crisis situations and SLAF operations. Well-established socio economic, local community and environmental adaptation of the airport operations which will be an advantage for existing and future developments. Considering the strategic significance, capacities and capabilities, the Colombo Airport Ratmalana will be developed under five main areas during this period as mentioned below. Colombo Airport Ratmalana handled 126 out of 576 of International Corporate Jets arrived in Sri Lanka during the last year 2017, which is a significant improvement compared to the last few years. Private Jet air travels has now changed over the years as savings in travel time, convenience, flexibility, security and comfort have outweighed the cost differentials compared to commercial aviation travel for the High Net Worth Individuals (HNWIs). The trend is increasing with the growing numbers of HNWIs in Asia and around the world. The Asia Sky Group reported in April 2016, that the business jet fleet in Asia Pacific stood at 1,134 aircraft in 2015, a 60.2% increase over 2014 figures. The strategic significance of Colombo Airport Ratmalana is very critical on the major development projects of the country such as Colombo Financial City (Port City) & upcoming Star Class Hotels to cater the emerging business travel needs of High Net Worth Individuals (HNWIs). 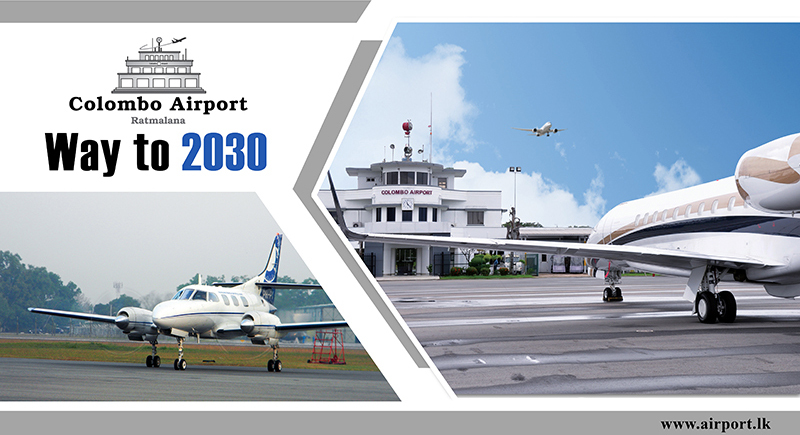 Therefore, it is necessary to adjust Colombo Airport Ratmalana to cater this potential demand of International Corporate Jets in both business and national aspects. Colombo Airport Ratmalana is the Domestic Aviation Hub of Sri Lanka and facilitating all 15 domestic airlines in all aspects and there are a number of requests from new operators and existing operators for expansion. 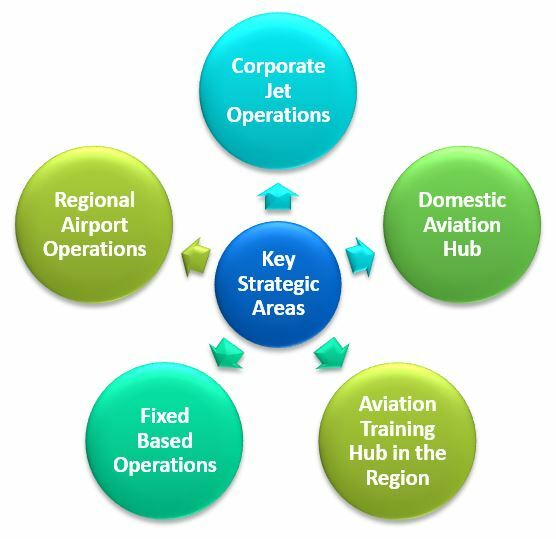 Domestic Aviation Hub strategy is focused on promoting the airport for the local, business tourists and connecting destination for international high-end tourists visiting Sri Lanka. For the implementation of this strategy, it is required to shift SLAF Hangars to the Northern side of the Runway along with structural modifications of the hangars, overlay the Apron and construct a new taxi way etc. On par with the growing demand for the aviation related education all over the world as well as in Sri Lanka, Colombo Airport Ratmalana experiences a derived demand from Aviation Training operators. There is a great potential of the foreign students (India, Maldives, Bangladesh, and Nepal) to come to Sri Lanka for their pilot and engineering courses which brings foreign currency to the country contributing to the economy. 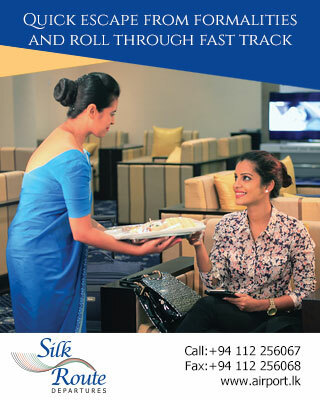 Further, improved facilities will create more favorable aviation training trend in Sri Lanka. Emerging market opportunities available to start regional flights to South Indian sectors and the Maldives from Ratmalana airport. Most of the South Indian & Maldivian citizens are used to stay around Colombo South area during their short stay as social & cultural compatibility and convenience. Above passenger groups can access to their accommodation within a few minutes from Ratmalana airport and airline operators also can get easy SLOT clearance.